The frog is a model of choice to study gene function during early development, since a large number of eggs are easily obtained and rapidly develop external to the mother. This makes it a highly flexible model system in which direct tests of gene function can be investigated by microinjecting RNA antisense reagents. Two members of the Fragile X Related (FXR) gene family, namely xFmr1 and xFxr1 have been identified in Xenopus. While the tissue distribution of their products was found to be identical to that in mammals, the pattern of isoform expression is less complex. Translational silencing of the xFmr1 and xFxr1 mRNAs by microinjection of antisense morpholino oligonucleotides (MO) induced dramatic morphological alterations, revealing tissue-specific requirements for each protein during development and in maintaining the steady state levels of a range of transcripts in these tissues. The power and versatility of the frog model is that the MO-induced phenotypes can be rescued by microinjection of the corresponding MO-insensitive mRNAs. Most importantly, this animal model allows one rapidly to determine whether any member of the FXR family can compensate for the absence of another, an approach that cannot be performed in other animal models. 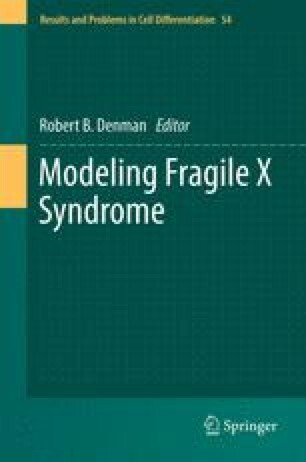 Research on the frog model has been supported by grants from the Natural Sciences and Engineering Research Council of Canada, the Canadian Institutes of Health Research, the FRAXA Research Foundation (USA), and the Fragile X Research Foundation of Canada (to E.W.K.) and by a grant from the National Cancer Institute of Canada and with funds from the Canadian Cancer Society (to T.M. ).